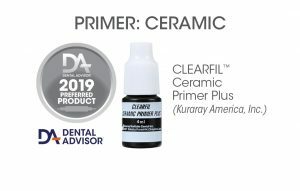 CLEARFIL CERAMIC PRIMER is a single-bottle silane/acidic adhesive monomer (MDP)-based coupling agent for use with indirect porcelain, ceramic, hybrid ceramic and composite restorations. It may also be used for intraoral porcelain or composite repairs. CLEARFIL CERAMIC PRIMER is reported to bond to any kind of dental ceramic, including feldspathic porcelain, zirconia, alumina, lithium disilicate and leucite-reinforced ceramics. No hydrofluoric acid etching is necessary for ceramics before using this product. A phosphoric acid etchant may be used to treat the intaglio surface of any restoration other than zirconia or alumina. Instructions recommend a single coat followed by air-drying. CLEARFIL CERAMIC PRIMER contains an ethanol-based solvent and requires refrigeration but should be brought to room temperature before use. Twenty-seven consultants evaluated CLEARFIL CERAMIC PRIMER for use with over 240 restorations. 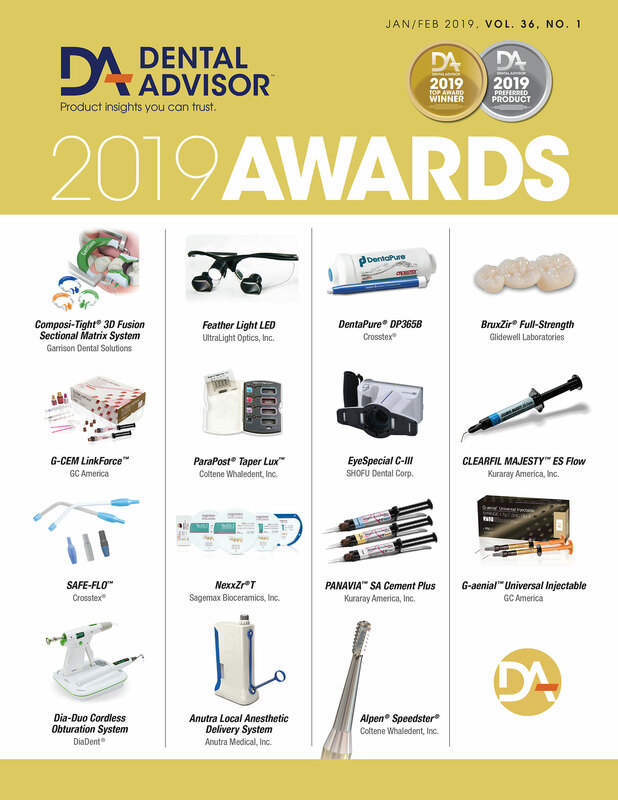 This product received a 96% clinical rating. Shear Bond strengths in self-cure mode of a dual-cure resin cement CLEARFIL ESTHETIC CEMENT with CLEARFIL CERAMIC PRIMER to zirconia. Clearfil Ceramic Primer is efficiently packaged in an easy-to-use squeeze bottle. Drops of primer are easy to dispense, so the volume dispensed is easily controlled. The viscosity of the product is excellent, wetting ceramic surfaces well. The liquid is colorless and has minimal odor upon application. Application time is very fast and the wide-ranging indications for use of this product made it highly appreciated by all evaluators. Every consultant judged Clearfil Ceramic Primer to be equal to or better than their current silane coupling agent. Eighty-one percent of consultants indicated they would switch to the product and 96% would recommend it to a colleague.